Styled with utility button-up . The Joplin is a modern mini with clean lines and slight A-line silhouette. It’s crafted from naked leather that’s been hand selected for a luxurious look and feel. It’s fully lined with a soft, breathable cotton-blend fabric. Fabulous quality, as always with Aritzia- Do take care of it because it is naked leather, and size down because it will stretch to your body within a few wears. This skirt is HELLO CUTE! It looks stunning with my over the knee boots. The leather is buttery soft and smooth (one of the pictures online left me guessing to the texture). The length is perfect. Sure, its a mini skirt, but its not too short to where I feel like I'm about going to have problems staying covered. 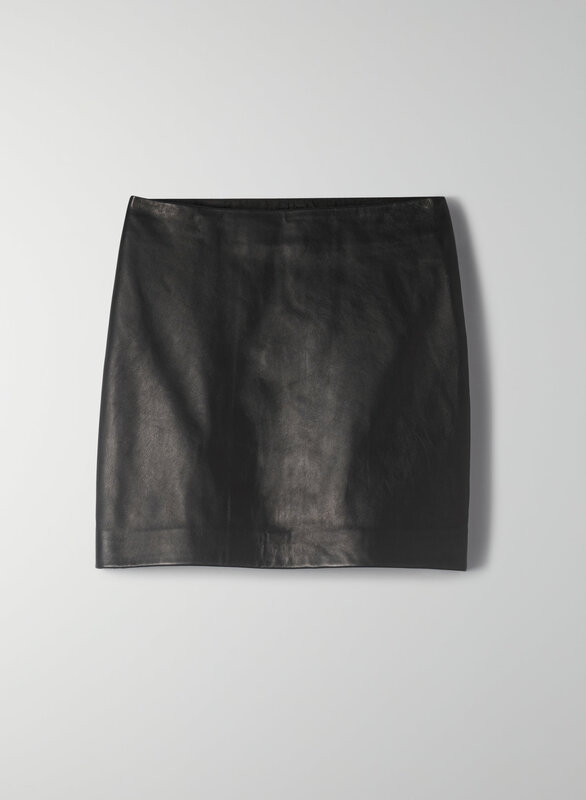 Some other leather skirts I have recently tried left me feeling boxy and square. This one makes me feel as great as I look! I certainly recommend it! The fit was exact to the sizing chart measurements - so measure! (I often wear size 2 in other brands, but I tried this size on and the 4 and definitely fit in the 4. Thanks to customer service for making sure I got the right size sorted out!) Its important with the leather since there is not much give. I chose the size for my waist and while my hips are actually one inch bigger than the sizing chart, the A-line of the skirt gave me no problem/the perfect fit. I've wanted a basic leather mini for a long time, so very happy that Aritzia carries this. The Joplin has an invisible zipper on the side (was hard for me to tell the difference between the Joplin and the Janis). I'm looking forward to wearing this skirt all year. I deducted one star due to price.